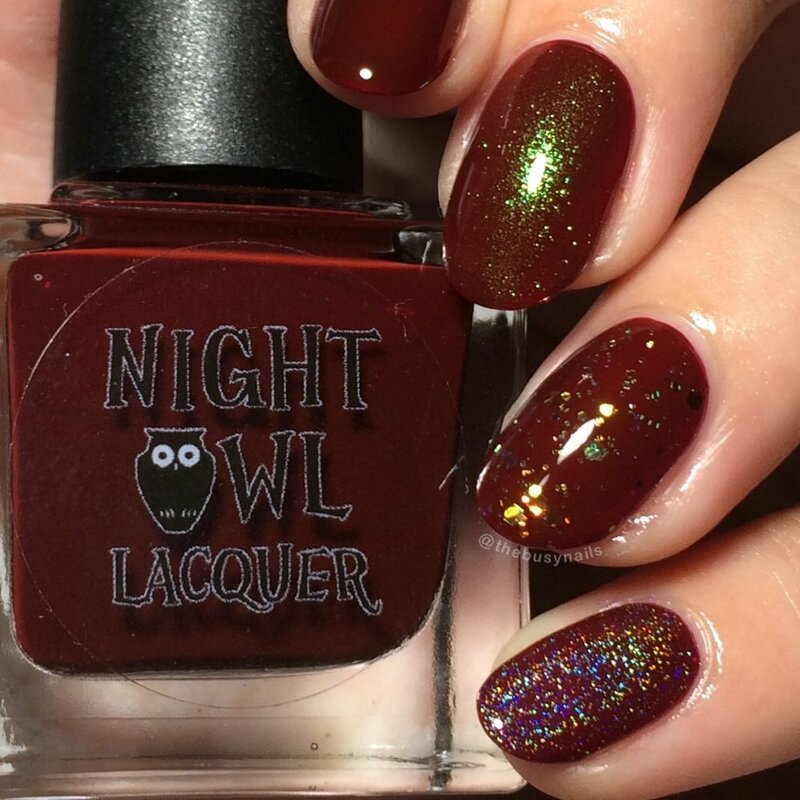 The Night Owl Lacquer "In The Dark of The Night" collection for fall 2017 consists of 6 cremes and 3 toppers. 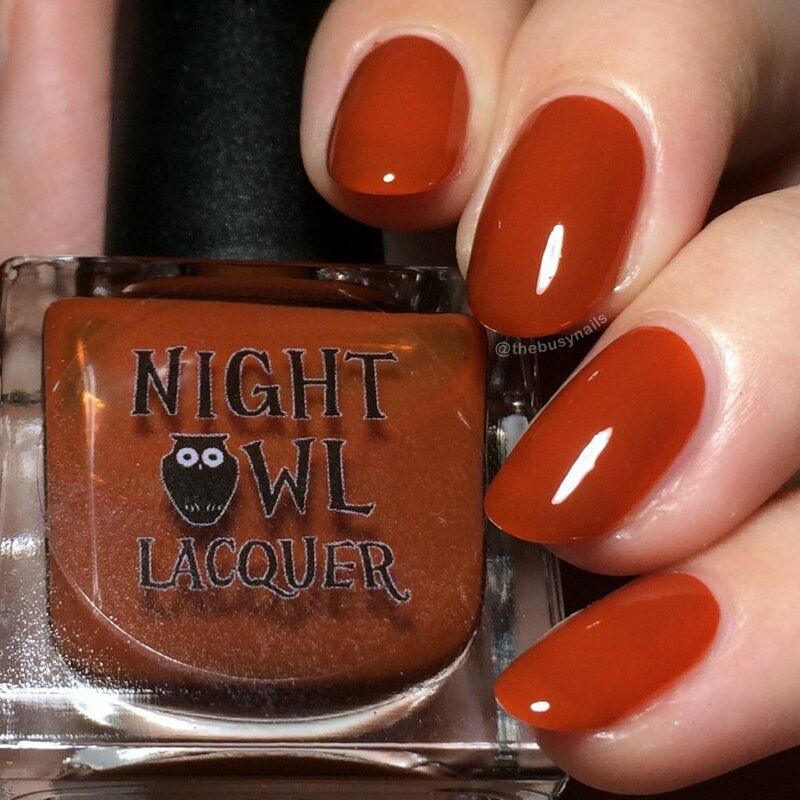 Read on for release info, swatches and my review. 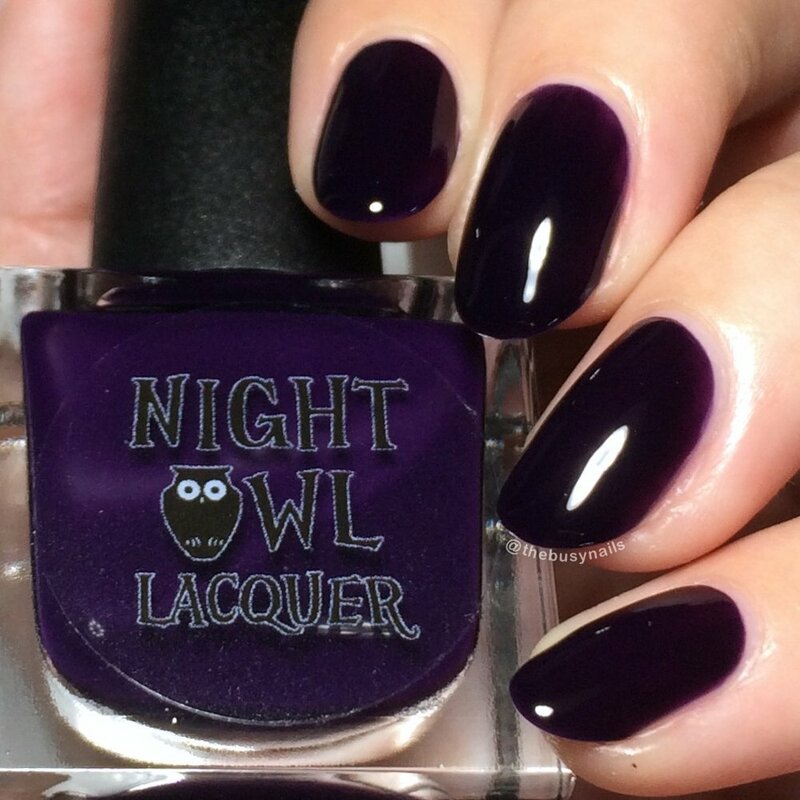 These will release Sept 29th at 8 PM MDT in the Night Owl Lacquer shop. All polishes will also be available individually at $7 each with the exception of Just Like Magic (holo topper) which will be $9. 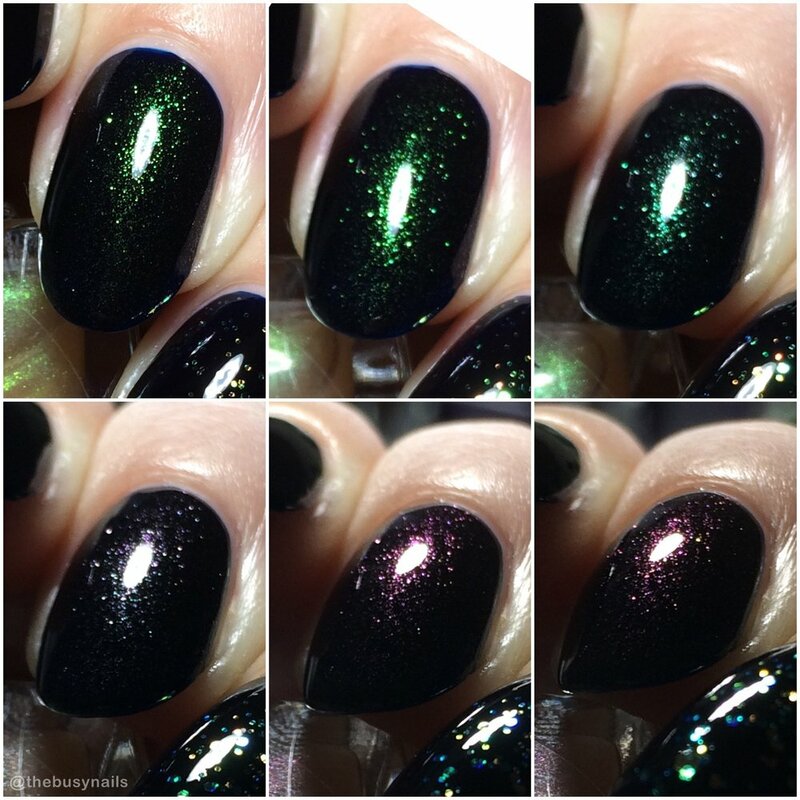 There is also a gorgeous 1 year anniversary polish called "Nightfall" releasing at the same time. Check out my other post on that beauty. All photos in this post are taken under artificial light. All worn over 1 base coat of Smith & Cult "Basis of Everything" and topped with Glisten & Glow HK Girl topcoat. These polishes were provided for my honest review. Every single creme had an excellent, self-leveling formula that went on very easily. These polishes go right where you want them which is important, since it's best to avoid too much clean up with such pigmented shades. With these, you hardly need it. I also felt like these lean slightly toward crelly territory rather than straight creme. I still got good coverage in two coats, but I'll note a couple where the crelly-ness comes into play. They also all dry VERY shiny on their own, except Cackle Much?! (purple) which dries normal, just less shiny. Also, you'll see that I topped each shade with the 3 toppers from the collection. More on those near the end of the post. Maker description: a dark grey creme inspired by werewolves. I LOVE grey polishes, so I was very excited for this one and it did not disappoint. It's a very chic, glossy grey that's pretty neutral - not too warm or cool. Maker description: a blackened orange creme inspired the headless horseman's pumpkin head. 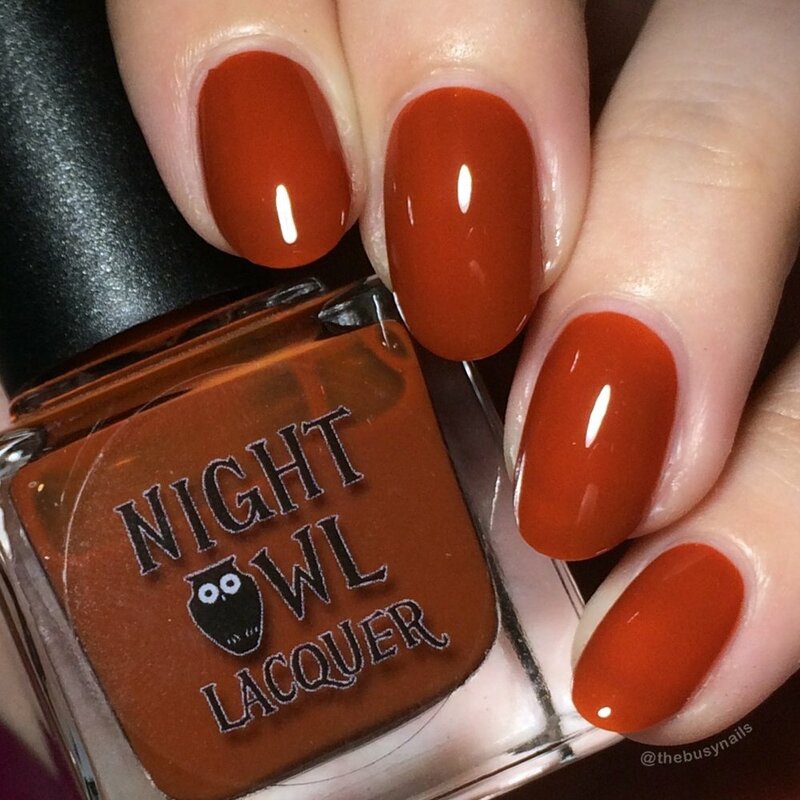 I'm a big fan of burnt orange nails for fall and this is a great option if you don't already have one you love. It's super pigmented and it's a perfect grungy, grimy orange that looks amazing on the nail. At two coats I had very slight VNL that you could only really see up close. Maker description: a blackened blood red creme inspired by vampires. "Blood red" is SO accurate. This is vamp in a bottle! It's very, very pigmented and builds beautifully. I do recommend applying carefully so you're sure to have even coats, otherwise you risk having slightly lighter edges due to that nearly-crelly formula. Maker description: a blackened purple creme inspired by witches. This is a suuuuper dark eggplant purple that's absolutely beautiful. No issues whatsoever, just dark, vampy goodness. It does dry down darker than the bottle and your polish newbie friends might mistake it for black. Oh, and "Lookin' Shifty" looks AMAZING over this one. Maker description: a blackened green creme inspired by zombies. Deep, dark, beautiful forest green. I especially love how all the toppers look over this shade! NOTE: I did experience a little bit of staining with this shade, even though I only wore it for about 20 minutes while swatching. I've already let Lindsay (the maker) know and she'll make a note in the listings. I also used a base coat that's not my go-to, and it's described as "ultra-adherent and resinous" so that could have played a role. Either way, I was able to remove all the staining by just scrubbing twice with pure acetone. Double up on your trusted base coat with this beauty! 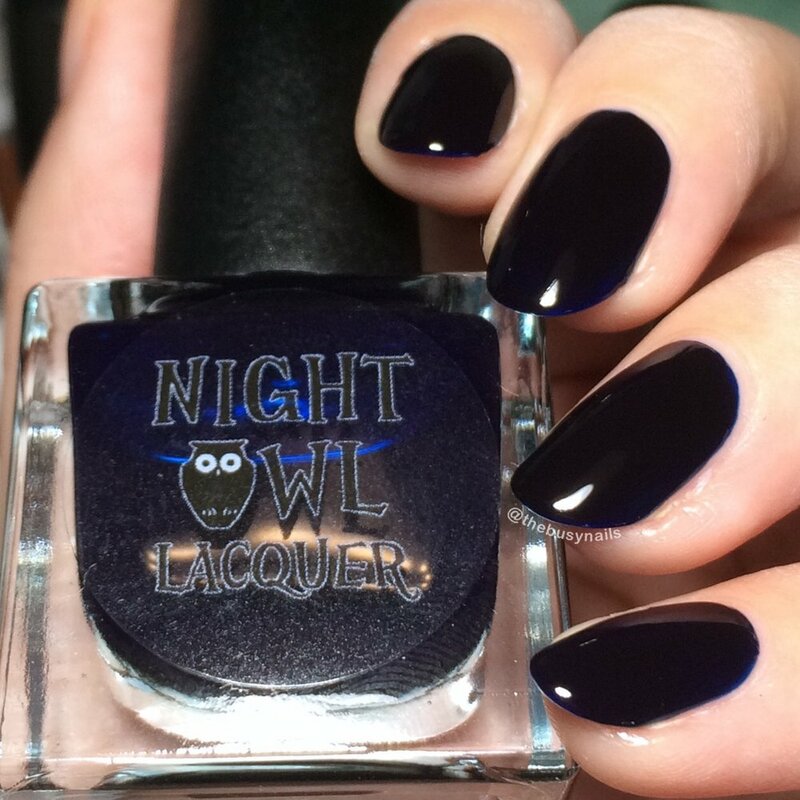 Maker description: a blackened blue creme inspired by the boogeyman. This blue is oh so inky and really, REALLY dark. Crazy dark. Only you your polish-addict friends will know it's blue, but everyone else will assume it's black. That's ok though, because it's very pretty either way. Maker description: a topper packed full of various sizes of lime/gold & orange/green iridescent shifting glitters. If you don't already own a topper like this one, this is a great choice. You'll get perfect coverage and evenly distributed glitters of various sizes in one easy coat. Maker description: a topper with a gold/green/red chameleon shift. This is similar to all the UP toppers that are popular right now, but it's not actually UP. You'll mostly see the pretty green shimmer but can occasionally catch the other shifts. I included a collage of some of the shifts I was able to capture. I really liked this one - it very much looks like it's part of the polish and not just a topper, especially over darker shades. 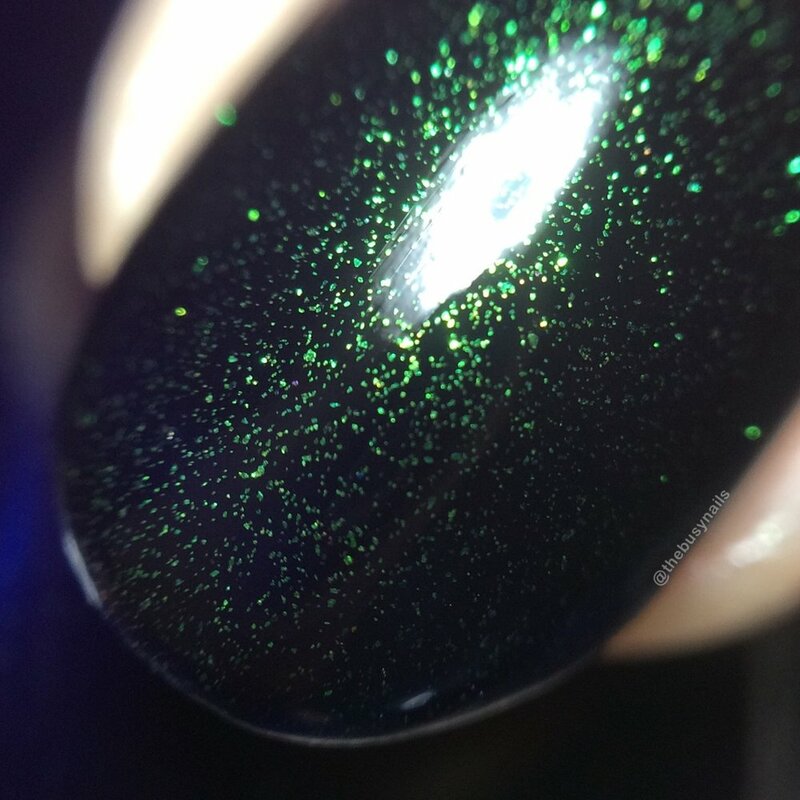 The holo in this is super strong and you get a ton of payoff in just one smooth coat. I did find it to be greying over the warmer shades, but it looks great over the grey and darker shades. Whew, that was a lot of polish! Which one is your favorite? I'm torn because they're all beautiful, but I really love Howl at the Moon (wearing it as a full mani now) and Don't Lose Your Head. 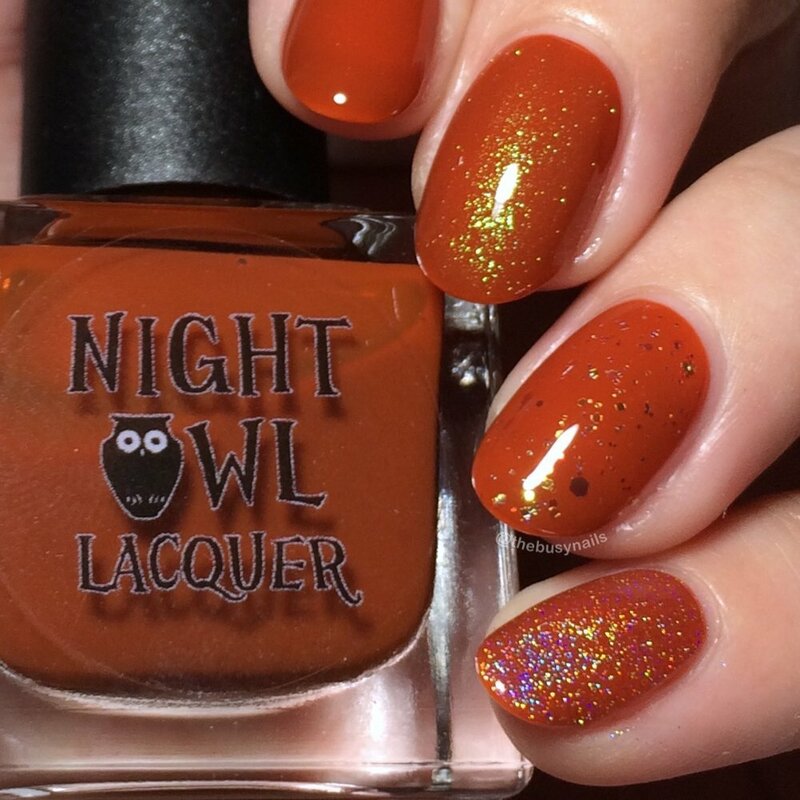 Once again, these will release Sept 29th at 8 PM MDT in the Night Owl Lacquer shop.